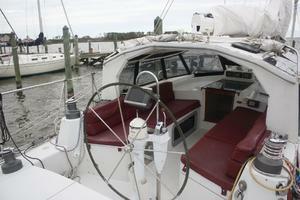 As the listing broker I also had the pleasure of working with the original owner and as a dealer for Sundeer Yachts. 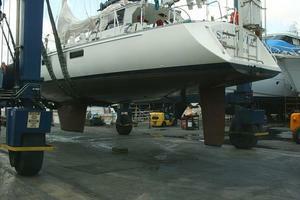 Sea Fever was built at TPI Composites, the original owner spared no expense in her construction and maintenance. 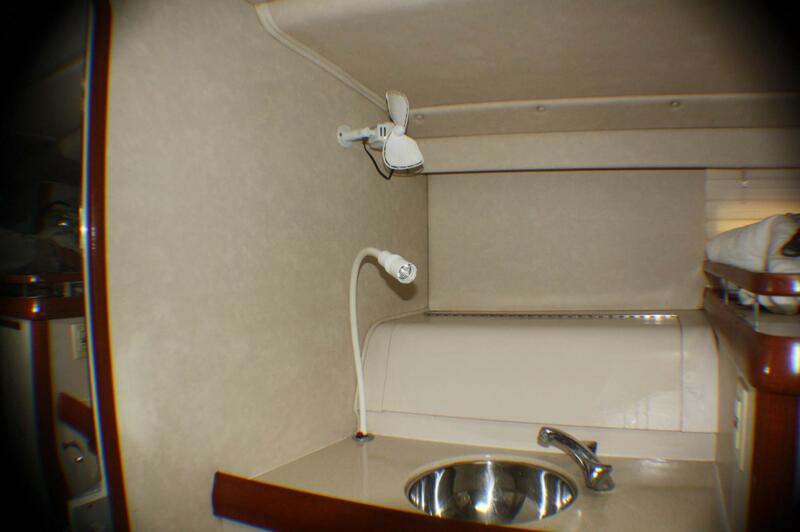 Sea Fever has a unique forward layout that offers a better sea berth with separate head & shower compartments. 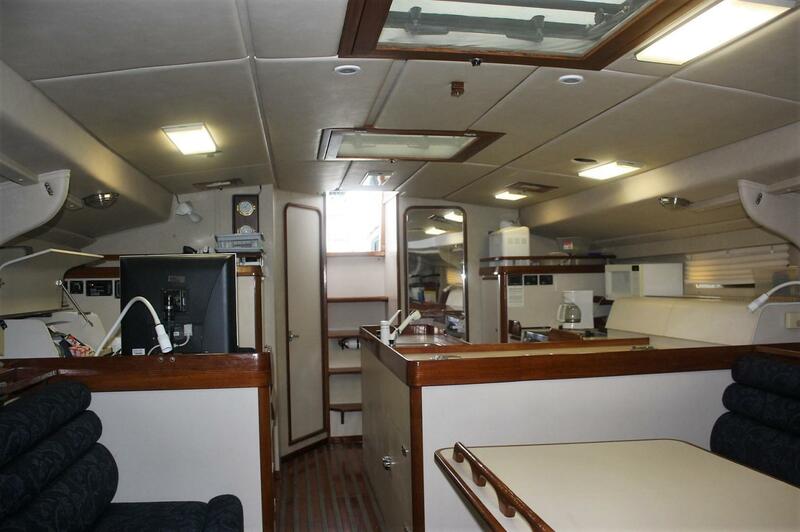 Sea Fever has the Dashew designed master stateroom forward with watertight bulkhead separating the huge forepeak storage compartment from the living accommodation. 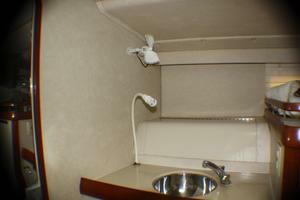 This private stateroom consists a port side Queen-size berth (Upgrade Plan B) with storage under and individual reading lights. Four drawers and three large storage compartments are located underneath the bed for more easily accessible storage. There are three extra large hanging lockers to starboard, with a large fiddled shelf above. 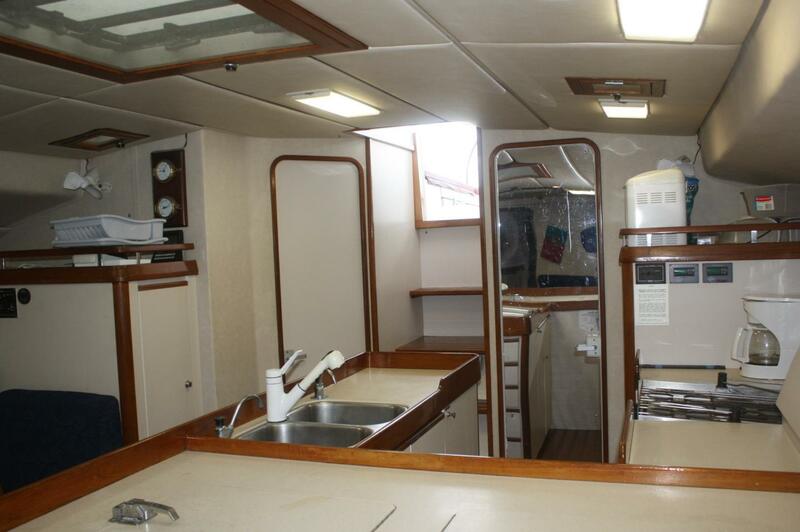 A vanity is located on the starboard side with a polished stainless steel sink. The vanity counter top has storage and easily accessed plumbing beneath, and a curved, opening bin storage compartment behind it. 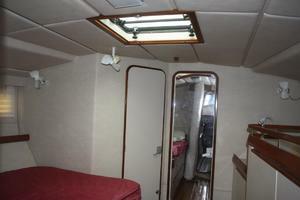 Besides the two reading lights, there is also a fluorescent light over the berth, and an adjustable light for the vanity. 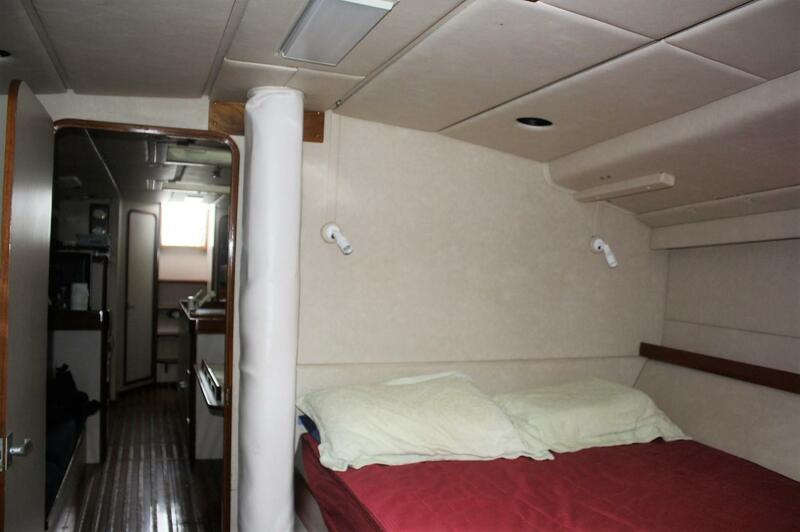 The master stateroom has two fixed, non-opening ports, a large 24”x24” Bomar opening hatch, two dorade vents with Vetus air scoops, and three 12VDC Caframo fans. Forward of the stateroom is a full-size head with storage cabinets to port and a Raritan 2 manual toilet connected to a 40-gal holding tank when inshore, and a separate full-sized shower with a seat to starboard. There is additional storage space in the shower. Leaving the forward master stateroom and moving aft, one enters the salon that contains an L-shaped dinette with dining table and seating for six to port. The dinette and starboard settee are custom upholstered. 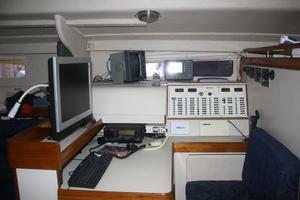 The salon contains an AM/FM radio/stereo cassette/CD/MP3 player with two external Bose speakers. 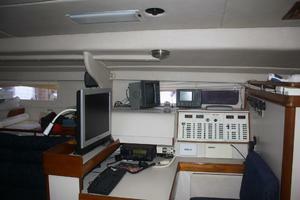 There are two additional outdoor marine speakers in the pilothouse. 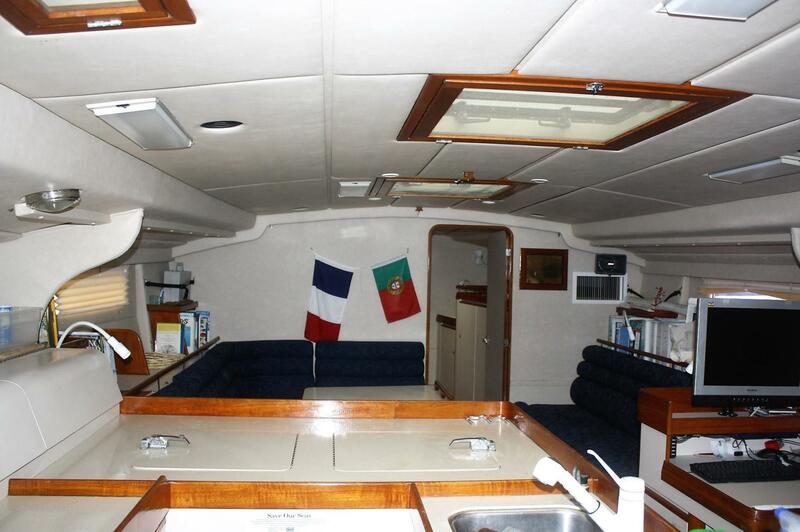 The teak cabin sole has walnut shell non-skid strips, and all teak trim is varnished. 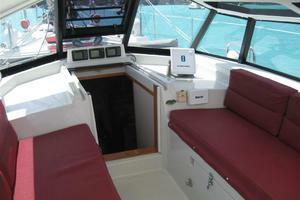 The cabin soles and lockers and drawers have positive locking latches for added safety at sea. Settees are fitted with lee cloths and may be used safely as offshore berths. Above and outboard of the settee backs are flat shelf type storage areas that have custom teak bookshelves. The multiple fixed ports found in the vertical hull surfaces in the salon and throughout Sea Fever below decks have hideaway-pleated shades to reduce daylight and keep dockside-prying eyes at bay! The overhead ceilings are vinyl foam backed material covered on Velcro removable panels. 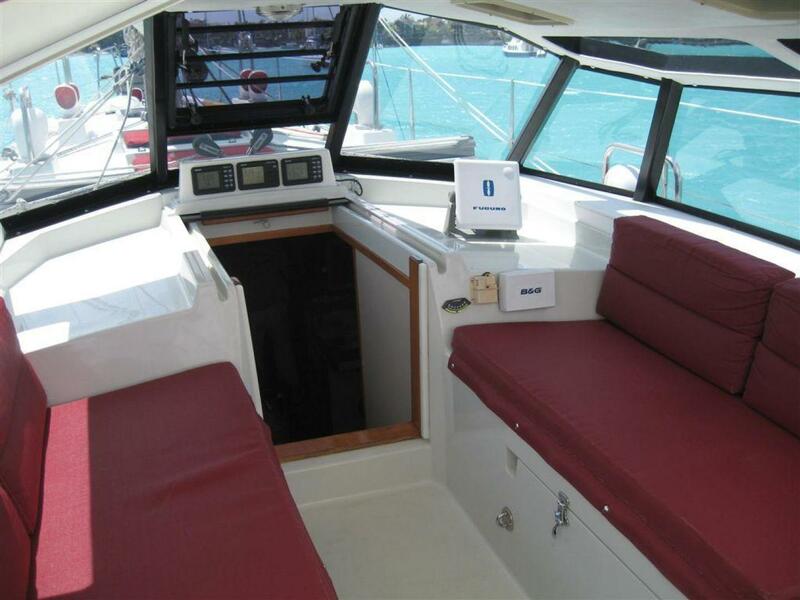 There are two large 31”x31” opening Bomar hatches in the salon, and two Bomar 10”x10” opening hatches above the nav station and galley, multiple dorade vents, fans and lighting throughout, making for a very well ventilated boat, especially when underway. The 200-gallon each matching port and starboard molded outboard freshwater tanks form the base of the settee backs. These tanks may be used to a moderate degree as water ballast to assist ship’s trim offshore. Beneath the eight settee seats are storage compartments for bulk items. Toward the aft end of the salon and to port is the U-shaped galley with centerline island. Contained in this area and outboard of the centerline double sinks is the gimbaled Force 10 three-burner stove with oven and broiler. 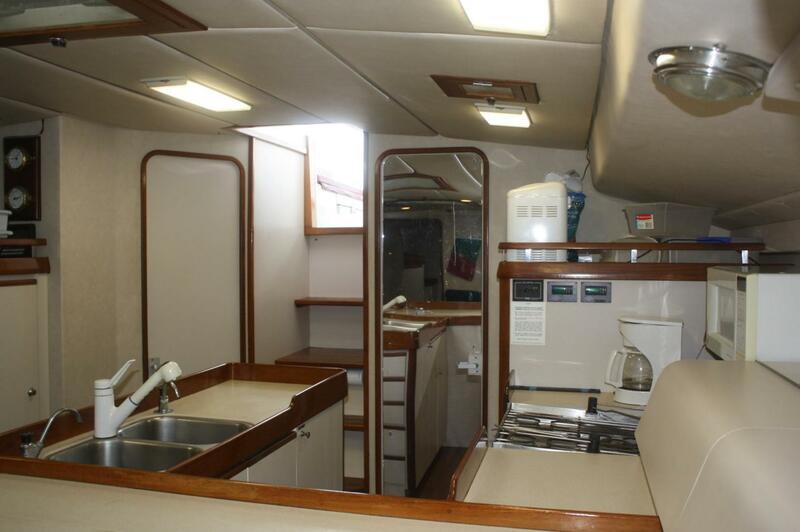 On centerline in the galley are located the twin, deep double stainless steel sinks with pressure hot/cold water and cabinet storage beneath. The composite Corian Fountaintop counter tops allow access to the large top loading freezer as well as the top and side-loading refrigerator. The storage in the galley area continues! Outboard are two more Corian counter work surfaces with curved front bin storage compartments, a huge vertical food storage locker, pot and pan locker, and storage on centerline beneath the sink and five-drawer storage at the end of the galley island. Aft of the starboard settee is the sit down ships office/navigation center. 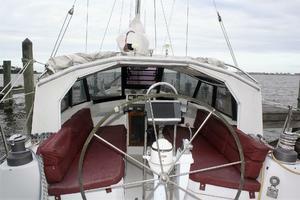 There is storage beneath the navigator’s seat, in the lift up chart desk and outboard in a curved bin. Behind the navigator’s seatback is a large hanging locker with shelf. To the right of the navigator is the DC/AC Paneltronics distribution panel. In the overhead is a 10” Bomar opening port and dorade. 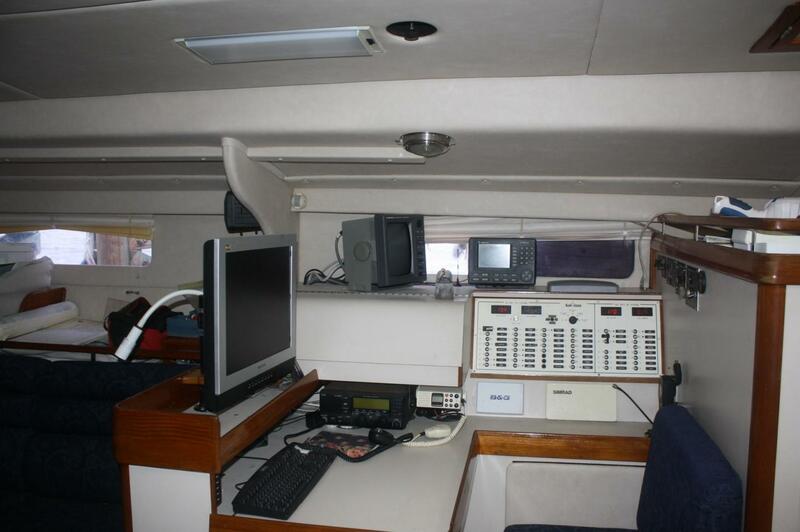 At the desktop navigation station is all the electronic equipment: Trimble GPS, Furuno radar, ICOM IC-710 SSB, Horizon VHF, B&G Hydro 2 instrument head and Iridium satellite phone (see Electronics for specifics). 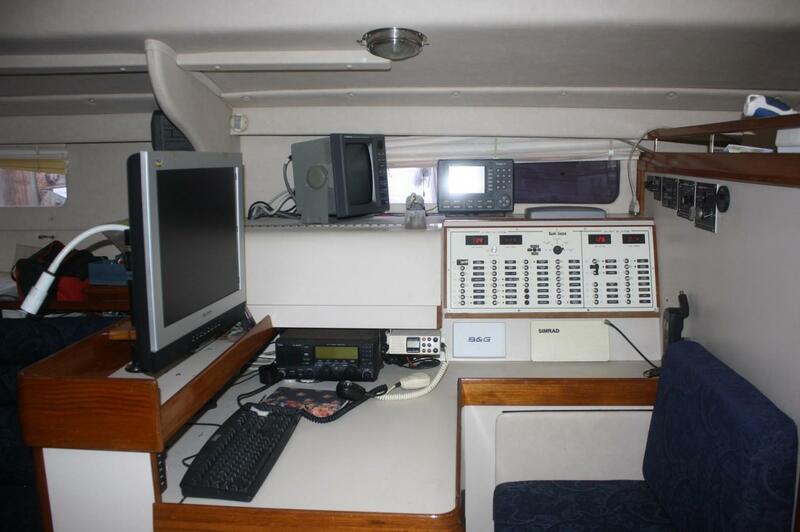 There is also a large LCD screen connected to a powerful, dedicated Pentium-4 computer for running email and Maxsea navigation software. Aft of the navigation station on the starboard side are the aft ship’s head with Raritan 2 manual toilet connected to a 40 gal holding tank when inshore, a washbasin with ample storage space below, and a shower with curtain plus a portable washer. Across from the navigation area and aft of the galley is the private guest stateroom with upper and lower berths, with lee cloths, Dorade vent, opening hull port, large opening port to the cockpit with optional screen, Caframo fan, and overhead and bunk lighting. You will find more storage in two vertical lockers on centerline and beneath the lower berth. 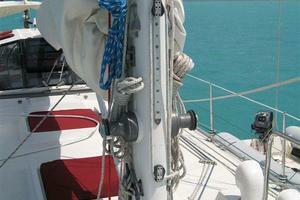 With minimum motion and separated from the main cabin, these make excellent berths for the off watch while underway. 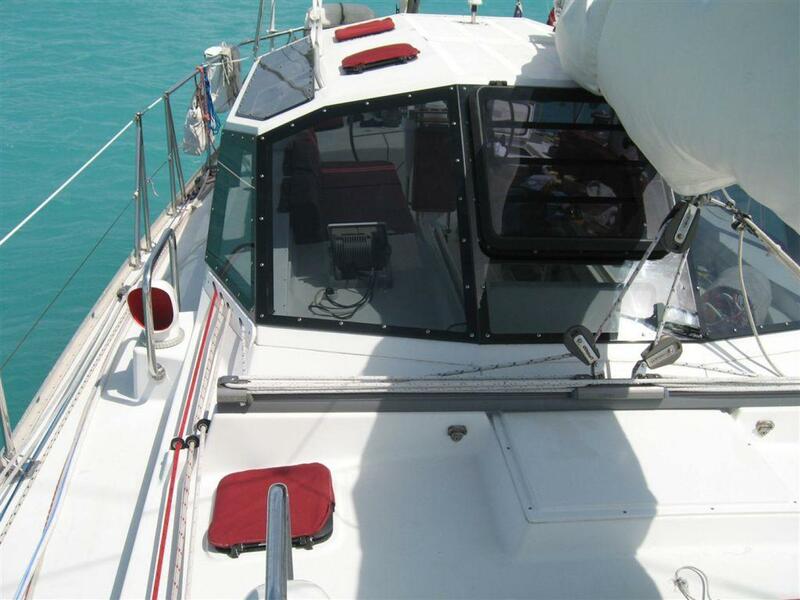 A custom watertight Bomar hatch low on the starboard side provides excellent access to the port side of the engine (starter motor, raw water impellor and alternator). The large, comfortable living area has no thru-hulls, completely eliminating the possibility of below waterline hull leaks in the living areas. 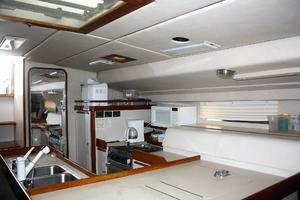 There is an enormous amount of storage throughout the interior. 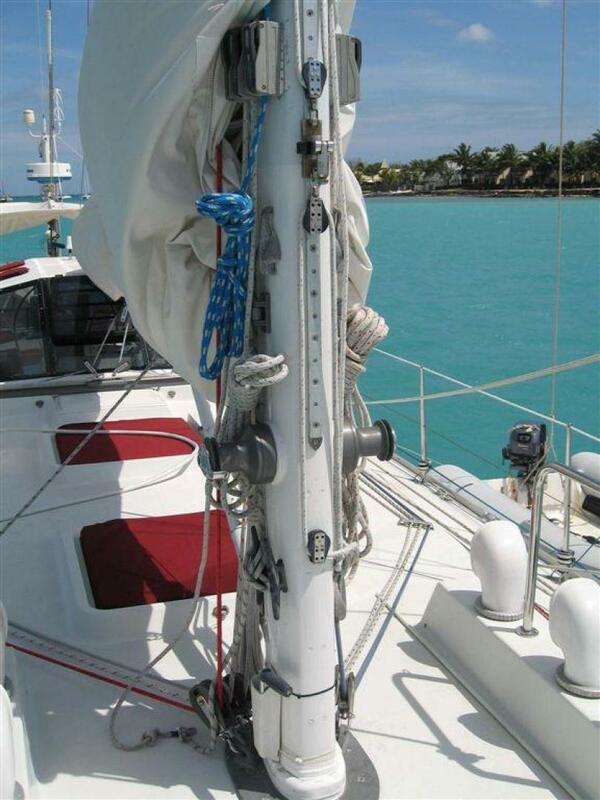 The large forepeak accommodates a full sail inventory, fenders, dock lines, spare sheets and halyards, spare anchors, a sea anchor and much more. These items are securely contained in stainless pipe storage bins with the all chain main anchor rode contained in a large PVC vertically mounted self-stowing tube mounted directly beneath the on deck windlass. 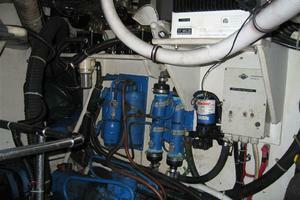 Also located in this compartment is the forward bilge pump. 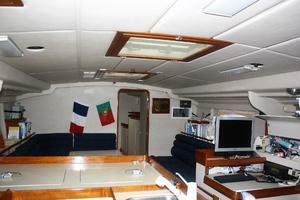 The compartment is lit by 12VDC fluorescent lighting and contains the remote control for the windlass. 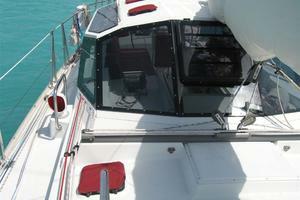 Access is via a deck mounted 24”x24” Bomar hatch, and a swinging stainless ladder. The depth and speed transponders are accessible through hatches in the flooring. There are two more very important safety features in Sea Fever, custom installed when she was built. The house batteries are accommodated in the top of the keel, but in this case have been enclosed in two watertight compartments, each with three access hatches and ventilation. 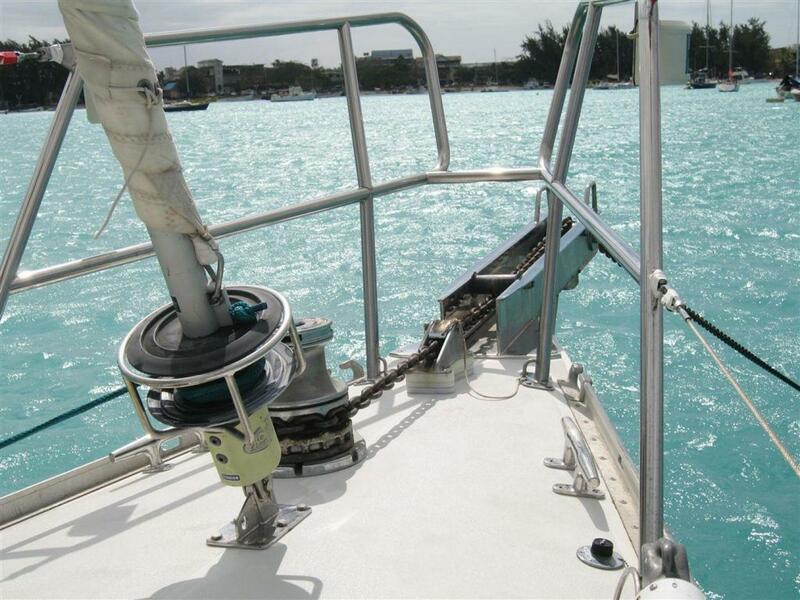 Secondly, there is a belt-operated emergency pump on the forward starboard end of the engine, connected to a two-inch PVC pipe extending the length of the boat, with valves in the forward peak, the saloon, the battery compartment and the engine room. If any one becomes flooded, the relevant valve can be opened, the engine started and a switch on the nav station control panel will start evacuation of the water at a considerable rate. 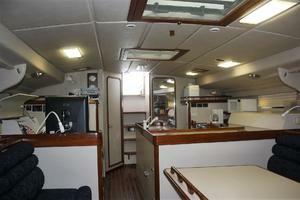 The aft engine room is separated from the main cabin by a sound insulated watertight bulkhead. 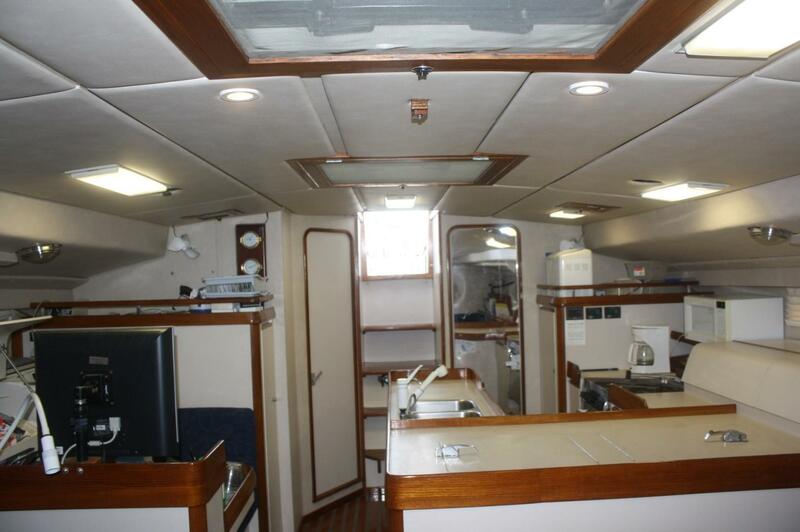 It has standing headroom, a workbench with vise, and storage bins on the starboard side. There is excellent overhead lighting. In this compartment you will find all of the ship’s machinery and thru-hulls to keep noise, heat and possible leakage out of the living areas. There are two fuel saddle tanks of approximately 117 gallons each. Fuel may be shifted from tank to tank by a 12VDC fuel transfer pump. These tanks may also be used, in conjunction with the water tanks, as ballast tanks. The engine room is accessed through the starboard cockpit bench seat. When open one has full standing room for work on a substantial workbench with a large vise. Above the bench is the Balmar 40 gals/hour water maker, (presently pickled) which makes water while the batteries are being charged, as it is driven by a belt-driven high-pressure Cat pump powered by an 8-kw Kubota diesel engine. The stainless steel fuel tanks are mounted to port and starboard and fitted with access cleaning hatches and drain valves for draining and cleaning. A 12VDC remote oil change system pumps out both the generator and the main engine’s oil for fast and easy oil changes. The lazarette is enormous and will accommodate all the necessary items for a world voyage. 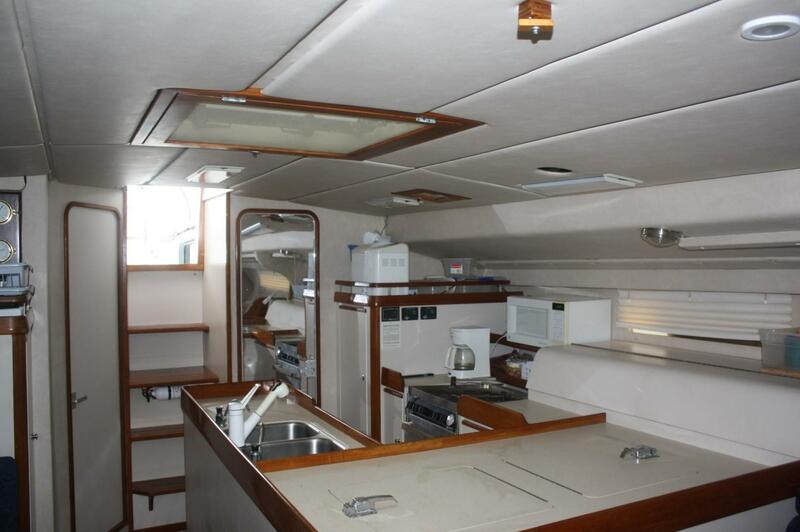 The area is accessible via two deck hatches at the aft starboard end of the cockpit, and is equipped with approximately fifty drawers where all the smaller spare parts are stored – all perfectly listed in a most comprehensive Excel spreadsheet. The deck area, as with all of Steve and Linda Dashew’s vessels, is designed for ease of sailing and is uncluttered. 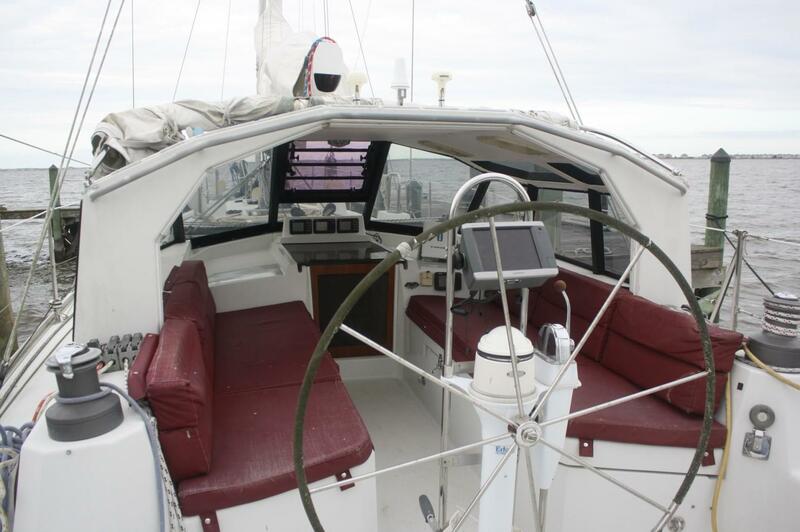 The cockpit is located aft with a fixed, custom-built aluminum pilothouse (see following description). There is a custom radar/antennae mast, cockpit cushions, swim platform, etc. All sail control lines are led aft to the cockpit. The propane locker is mounted in its own sealed compartment aft to port and contains two 20 lb. aluminum propane bottles. 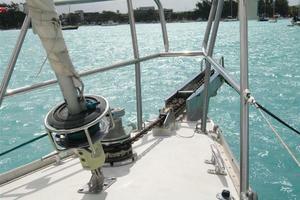 In the unlikely case of propane leakage, the compartment drains safely overboard. The deck has been designed with fresh water fills located aft port and starboard to allow for rain catchment so you may fill the ships tanks without going to a dock to replenish!. Teak insect screens for all cabin hatches. Insect screen for companionway hatch plus lockable washboards. Dock lines, and four large fenders. 200 feet of five eighth inch diameter line. 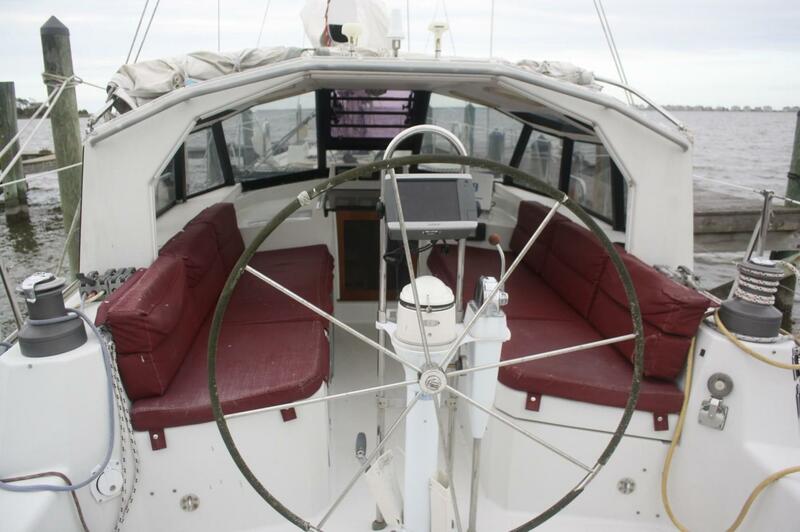 The substantial aluminum pilothouse was custom built by New England Boat Works of Rhode Island. There are four ten inch Bomar opening hatches overhead and one large 24 by 24 inche Bomar hatch on the forward face for additional ventilation. 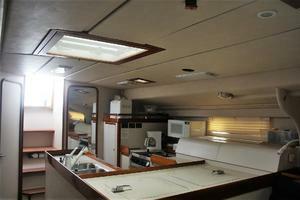 The lLxan windows of the pilothouse were replaced with new tinted plexiglass in 2006. There are aluminum handrails all around outside. 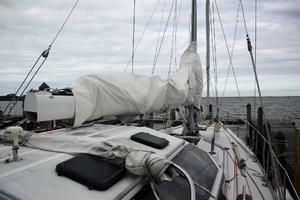 A custom inclosure can be rigged to protect feet and cushions from rain when sleeping in the pilothouse. 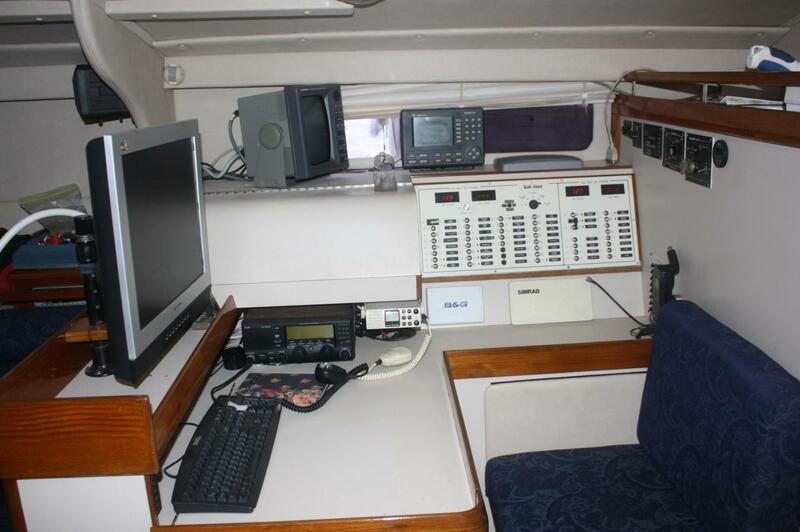 ICOM IC-M710 SSB radio with tuner, 75 square feet of copper foil ground molded in hull. Trimble NT200D GPS with NMEA to B&G instruments, radar, computer, and autopilot. B&G Hydra Pilot system with dual control heads, dual remote controls, dual processing units, two fluxgate compasses and one B & G T2 pump and one Simrad hydraulic pump. Pumps new in 2006, one processor upgraded to 40 amps in 2005 and new remotes in 2006. Balmar/Kubota 20hp diesel generator with 250-amp direct drive alternator delivering 12V directly to the main batteries, with a Balmar MC-512 voltage regulator. The generator is installed with a direct drive to a Cat-Pump for the watermaker, so both battery charging and 40 gph of pure water can be done at the same time. 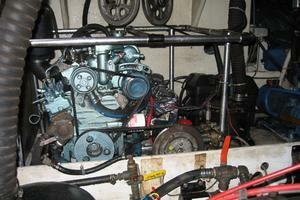 Second Balmar MC-512 voltage regulator added for the single 200-amp main engine alternator. Large custom 6” diameter engine air vents built in to engine room to prevent diesel fumes from reentering and polluting the engine room. PSS dripless seal replaced in 2006. Portable high volume Edson hand pump. Permanently installed hand pump in cockpit with inlet plumbed into main cabin. High volume emergency water pump with direct drive from engine with plumbing and valves for each of four watertight compartments. Custom installed manual Whale Gusher 30, operated from the cockpit to satisfy Ocean Racing specs required by the Arc Rally organizers. Standardized and interchangeable Shurflo water pumps for fresh water, fresh water deck wash, hot-water recirculation pump, and fridge cooling. Four station tank tender quantity gauges for both fuel and water tanks. Air conditioning system tied to fridge compressor (fridge compressor motor is upgraded to three quarter HP.) 11,000 BTU capacity blower is mounted in matching timber box at aft end of forward stateroom. Cool airflow can be directed into sleeping cabin, salon, or split between these areas. When refrigerator system comes on, the A/C automatically shuts down until box temperature is attained. Three cockpit pad eyes for safety harness attachment. Four inflatable life vests/safety harnesses with strobe lights. Extra Solas flares, day and night. Switlik six man life raft (inspected and certified in 2006), located on stern in custom stainless steel cage for easy deployment, with cover for protection. Aluminum collapsible gangplank, approximately 8ft in length for Mediterranean mooring (stern to dock). 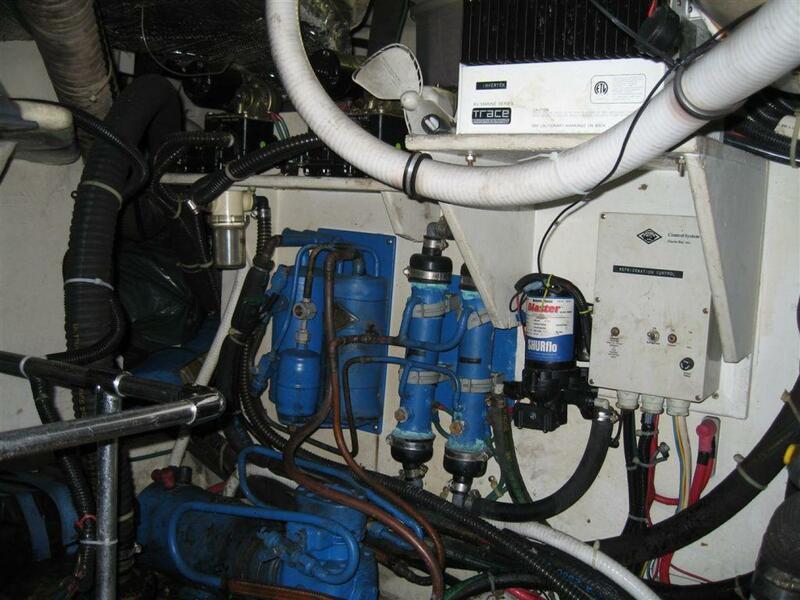 Many individual spares including Trimble NT200D GPS with antenna, spare autopilot pump, engine starter, head rebuild kits, Balmar alternator, Yanmar spares, macerator pump and heads for galley, Shurflo pumps, and Balmar regulator. 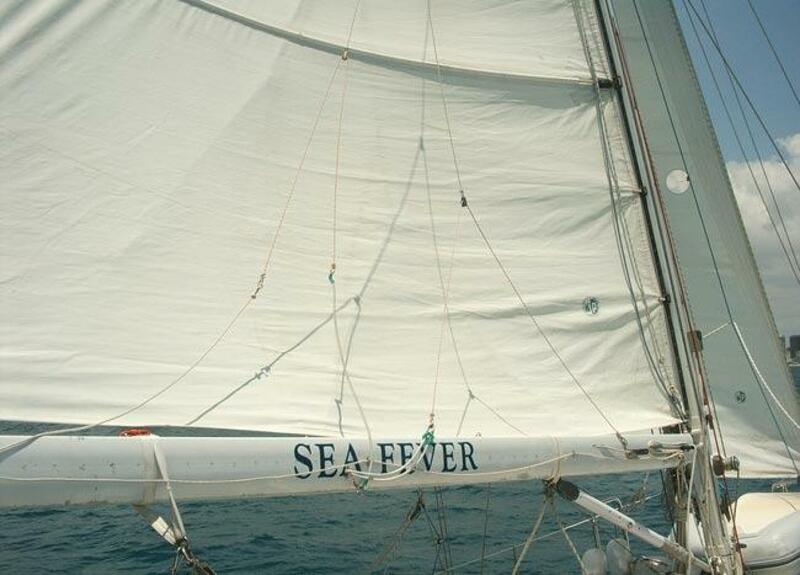 Sea Fever was built in early 1997, and launched in August the same year. The original owners proceeded to sail her over 30,000 nm in the ensuing eight years, making three transatlantic crossings (with a fourth made under a competent hired captain). In the 2000 Arc Rally for Cruisers there were 225 entries including many larger boats; Sea Fever finished the 2,800 nm course in 14 days, averaging 7.96 knots, coming in 10th over the line. She beat all the many Oysters including two 60s and one 70 across the line. In 2002 she entered the Caribbean 2000, a rally/race from Hampton, VA to Harbourtown, Tortola, BVI, and became one of a select few boats to ever finish the Caribbean 1500 in less than 7 days. Two of the others were Dashew’s 80-footer in one of his previous entries, and a brand new (light and empty) custom Hunter racing 50-footer sailed by two previous Around the World single-handers, who beat Sea Fever by four hours in the same race. 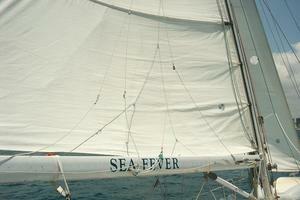 During that race, Sea Fever did a noon-noon distance of 232 nm, for an average speed of 9.6 knots. 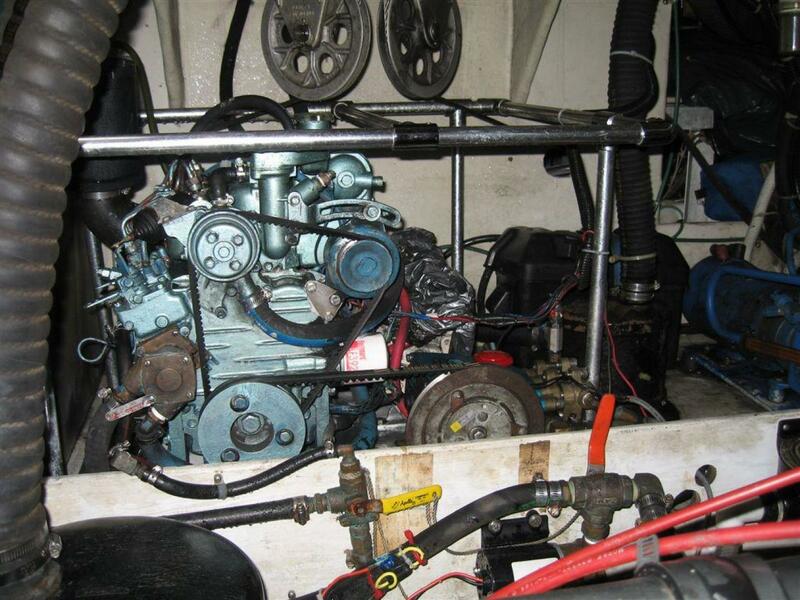 Bear in mind that Sea Fever was in normal cruising trim, with full tanks, generator, cruising supplies, spares, bicycles, etc., not a stripped out racer! 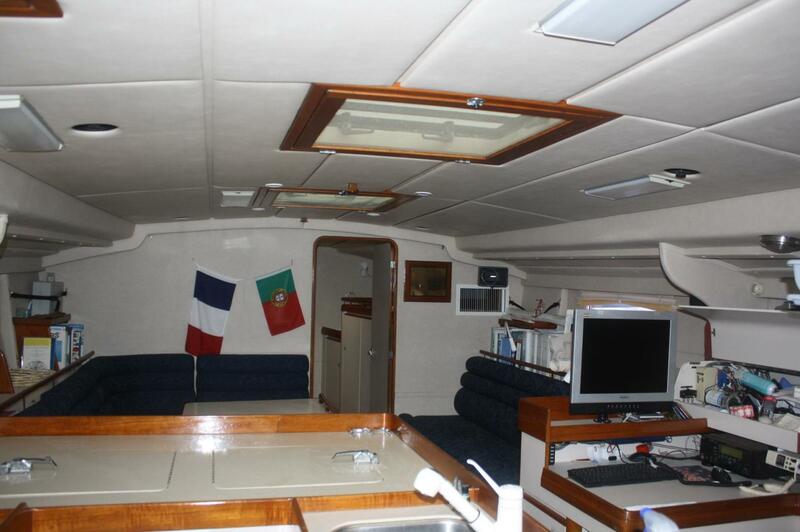 From March 2005 to May 2007 Sea Fever sailed around the world by the owners son, his wife and two young children. 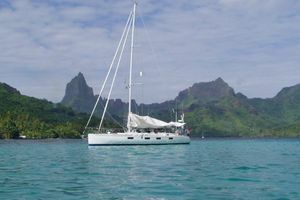 An extract from an e-mail reads “The strong trade winds (20-35kts) allowed us to make quick work of these passages and we typically had boat speeds in the 8-10 knot range with occasional bursts up to 13 knots.” Note that this was with the husband and wife crew only in full cruising mode. “Sea Fever” was built by TPI Composites, Inc. in Warren, Rhode Island. 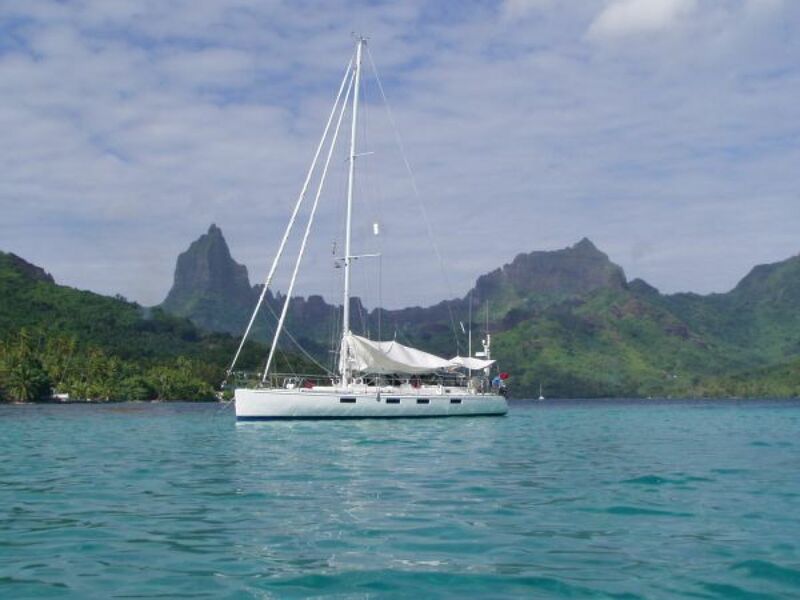 She is a true world voyaging blue water performance cruising yacht that was sailed by its co-owner/son, wife and two small children. Easily handled by two people, designed for comfort, speed, and above all, safety. Sea Fever’s estimated replacement value is in excess of $1,000,000. In the opinion of the present owner/seller there is no better boat for a short-handed circumnavigation than a Sundeer 60. 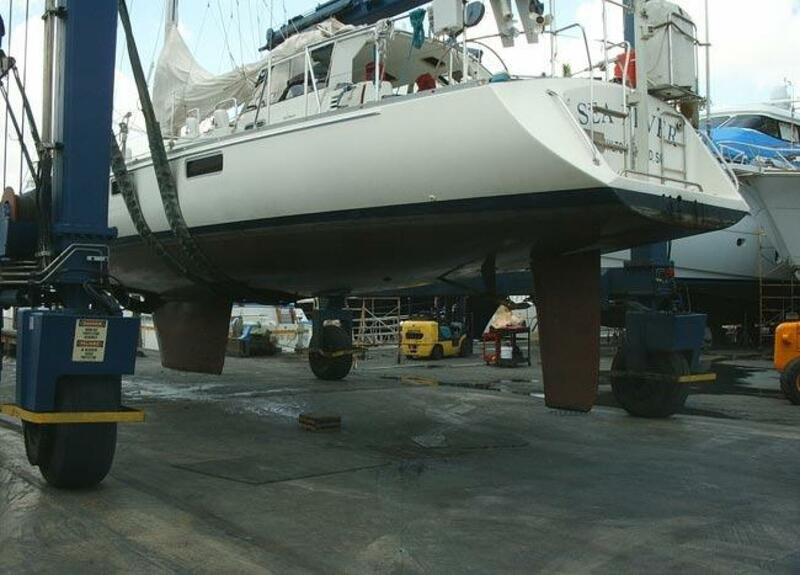 As the listing broker I also had the pleasure of working with the original owner/seller and his family as project manager during Sea Fever’s construction, commissioning and lengthy sea trials. The seller spared no expense in her construction and safety equipment. 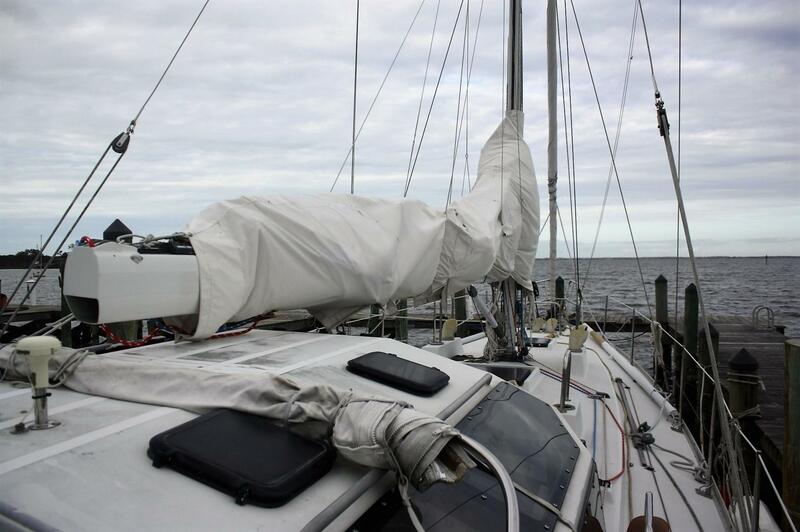 As stated the vessel was well tested including a 900+ mile flawless delivery from Newport, RI to Hilton Head SC. The present owners/sellers have continued to maintain and care for Sea Fever in the highest standards. Many upgrades have been added along with a continued excellent maintenance schedule.